"For thousands of years, it has drifted through space, unimpeded, forgotten, seemingly lifeless. Now, finally, it has been discovered. The Doctor soon realises that the Makara have been programmed to kill, but by whom, and for what reason? Finding out the truth will mean uncovering a secret that threatens the entire Universe." The following review contains massive spoilers for this play from the very start. Please read NO FURTHER if you do not want twists and character / plot developments ruined. I cannot stress enough how from the off YOU WILL BE SPOILED should you choose to read any further. Heard the one about the spaceship that’s about to crash with a sole occupant left behind, sending out a distress signal which is picked up at the last possible minute by a man in a Police Box, who materialises on board to save the otherwise doomed pilot? What’s that? You have and it featured the Eighth Doctor? How about you listen to it featuring the Sixth Doctor for Big Finish instead. No? Then maybe the Big Finish play where we are introduced to a new companion that turns out to be solely for this tale, as they’re secretly a baddie? Again, you can pick The Fifth Traveller or this one: it’s your call. You catch my drift, I’m sure. 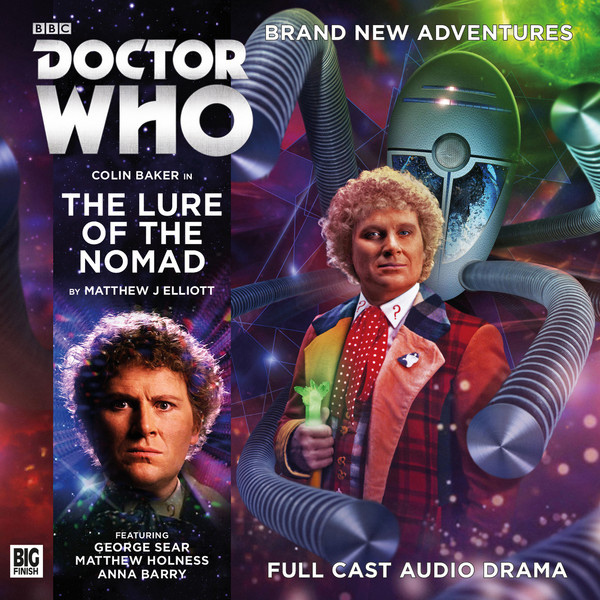 The Lure Of The Nomad, written by Matthew J Elliott, is Big Finish’s 238th main range release and boy does it feel like it. Uninspired and riffing off past glories, it’s difficult to imagine that anyone genuinely read the script without a feeling of déjà vu hanging around. I simply cannot believe the CD extras where they express surprise at the ending. From the moment the story was announced with tiny fanfare for the supposed new companion, and no image of said companion on the cover art, I would have had money on them either dying or turning out to be a wrong’un by the end of the play had I been able to get decent odds anywhere, so when the twist comes that Mathew Sharpe is not the man we thought he was, it was less a surprise and more a case of “Well, obviously, yes. Can we hurry this up now please?” It’s a pity but not something that shocked me, and if anything that’s the saddest part of all. Nicholas Briggs kicks off the play by announcing with funereal gravitas that you’re listening to a Big Finish production, but he needn’t have bothered. By the time we have references to Quarks, the very first Dalek serial and a joke about carrot juice and exercise bikes riffing on Terror Of The Vervoids, I could have guessed. Later nods to Terileptils, Harry Sullivan and Stattenheim remote controls only add to this sense of it being business as usual, where characters cannot go five minutes without making a nod to past adventures and winking unsubtly at the audience. Done well, these sorts of kisses to the past can be fine and not derail the action, but done with the sledgehammer regularity as is the case here, they are not. Indeed, the one to Harry is the worst offender. It stems after Mathew makes a reference to the boxer John L. Sullivan, which makes no sense for the character. We’ve already had much said about how far into the future he is from and so he is unfamiliar with cultural touchstones such as Monty Python’s Flying Circus, so why would he then be able to namecheck a boxer dead since 1918CE? I know this is a minor point, but it’s symptomatic of a script littered with clumsy dialogue. The opening scene is painfully bad with its on-the-nose exposition, for example: nobody in the world speaks how the two characters here do. It’s the sort of ham-fisted “Let us set up the backstory” chatter we mocked The Space Museum for many moons ago now, and it’s sad to see we haven’t moved on yet. Elsewhere, we’ve more than the usual quota of ‘say what you see’ descriptive lines and the conclusion features a self-sacrifice so out of the blue and out of character that it’s insulting to suggest it happens for any reason other than to wrap up the plot. The Lure Of The Nomad is not a good play. There are good aspects, but good aspects do not a good play make. For what it’s worth though, these good aspects include an amusing joke about the plural of ‘octopus’ and nice performances by Matthew Holness and Anna Barry in the guest cast. The final scene is relatively underplayed and memorable, too. It’s for these reasons and these alone that it gets 2 out of 10. Three very good main range plays followed by two of the worst in recent memory? I really hope things pick up again soon. The Lure Of The Nomad is as forgettable as it gets.